It's been a while since I've posted anything food related so I figured I'd post a special treat today... my Nannie's recipe for Christmas Spritz Cookies. These little bites of joy are my absolute favorite cookie. And for someone who eats/sleeps/breathes anything chocolate, that's saying something. Preheat oven to 350 degrees F. In a medium bowl, combine flour, salt, and cinnamon and set aside. In the bowl of a mixer, cream together butter and cream cheese. Add sugar and egg yolk and beat until fluffy. Add vanilla. In thirds, add the dry ingredients. 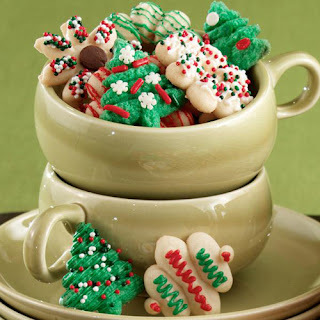 For holiday cookies -- Divide dough into two sections. Color half red and the other half green. Use approximately 6-8 drops of food coloring to achieve desired color. Fill a cookie press with dough and press cookies onto ungreased cookie sheet. Sprinkle with colored sugar to decorate. Bake for about 12 minutes, or until the cookies are golden brown on the edges and bottoms. Immediately remove from cookie sheet and cool. It's a family tradition to get together and bake Christmas cookies so while I was home for Thanksgiving, my mom, sister and I whipped these up along with some sugar cookies. I love love love this time of year -- spending quality time with friends and family and enjoying the sights and smells of the holiday. What are some of your favorite holiday traditions? Yummers these cookies look soooo good! Thanks for sharing!